Royal Wharf has today confirmed lease agreements with a variety of new tenants to provide health and beauty amenities for residents and the local community. With all 3,385 new homes under construction and over 1,400 now complete and occupied, current and future residents will have convenient access to a dentist and pharmacy, along with a hair salon and nail and beauty bar on their doorstep. Making health a priority, Ballymore and Oxley have leased commercial space to Royal Wharf Dental, a new practice which will provide comprehensive dental care, cosmetic dentistry and facial aesthetic care. Heading the practice is Dr Luke Thorley. . Royal Wharf Dental will not only provide excellent care, but convenience as well with early morning, late night and weekend appointments available to ensure accessibility for all. Joining Royal Wharf Dental is Royal Docks Pharmacy, a comprehensive pharmacy service which includes access to over-the-counter medication, holistic treatments and beauty products. With further consideration to the often well-travelled lives of London professionals, the pharmacy will also include a walk-in travel clinic. The beauty needs of Royal Wharf residents will be well-catered for by Silverclip Concept Store. Bringing a new twist to hairdressing, the store will include a children’s play area, a VIP room for groups, wedding packages, a bar and 24/7 online booking system. The salon will also feature a large retail area, selling quality hair and beauty products. These services will be complemented by Dream.Nails, a nail and beauty treatment salon which launched its first store 12 years ago with its new store soon to open at Royal Wharf. The salon will provide nail, waxing and facial treatments, as well as retailing their own range of Dream.Nails products. Committed to life at Royal Wharf being one of wellness and happiness, Ballymore and Oxley will also be opening a state-of-the-art leisure facility, The Clubhouse, in December 2018. Designed by David Morley Architects, renowned for their design of the London 2012 Olympic Water Polo Arena, the world class leisure facility will provide residents with a stylish hub for physical activity and includes a 25m swimming pool, hydrotherapy pool, sauna, Jacuzzi, and gym. In keeping with the facility’s modern approach to fitness, The Clubhouse Gym uses Technogym’s latest equipment and workout machinery. Designed with innovative Multidrive Technology, Technogym’s products are unique, enabling users to train cardio and power simultaneously whether you are a beginner or high-performance athlete. 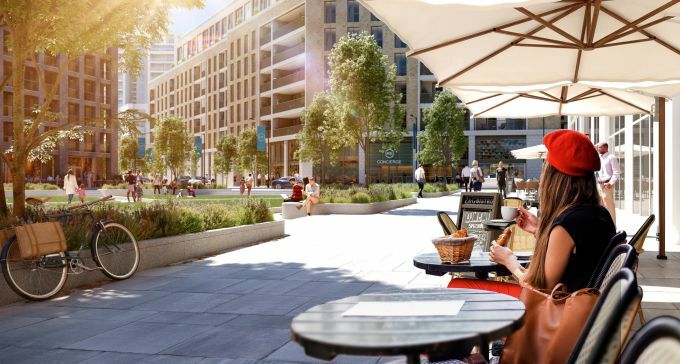 The influx of health and lifestyle services at Royal Wharf demonstrates Ballymore and Oxley’s commitment to creating developments that are not only architecturally beautiful, but foster a sense of community and neighbourhood. As such, the pharmacy, dentist, hair salon and nail bar will join established tenants Sainsbury’s and Starbucks at the development, while it was announced in January 2018 that Fuller’s, the London brewer and premium pub company, will open a 2,000 sq. ft. space on the riverfront.